Netwest hosted a free class on building a blog and eleven attendees are bloggers tonight. 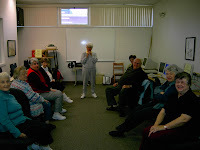 The group met with instructor Kay Lake at the Moss Library in Hayesville, NC today. They varied in range of experience from some who had never seen a blog to one who helps friends with websites. Within in a short time energy filled the room, and once the initial fear of the process passed, the new bloggers took to the keyboards like chickens pecking corn. Brenda Kay Ledford was the first to post to the Netwest blog. I'm sure we will see more from her in the near future. As the internet grows in importance in the life of writers, and all people around the world, we must keep up with technology, no matter our age. Younger generations have set the pace and it is a fast one. What better way than to build a blog and write every day? More senior adults use computers on a regular basis than younger folk. Of course the younger ones have gone on to more sophisticated technology than email and google research. Today I was told I should subscribe to Skype. Guess that is the next project I'll try in order to increase my dendrites.